This hack allows you to see enemy ranges using the Select key! Use A to toggle between attack range and staff range. I’m willing to bet that the range tiles and minimugs use the same palette slot in the RAM - surely editing this would be as simple as changing like… one byte in the routine, no? That might conflict with the normal range display, so I just removed the minimugs while the range is being displayed. Perhaps you could force the unit window to always use the “burst” setting when enemy range displays? That way you can keep track of units’ HP, but still circumvent the palette glitch. But also, I’m afraid there are more bugs to report. If you hit Select while highlighting one of your units, they will stay “active” after your cursor moves off of them. The burst panel also looses its slight transparency effect. If you hit Select while highlighting one of your units multiple times, it will create little artifact map sprites that get stuck behind the main one when you hit B. If you move the cursor off of the unit after these artifacts pile up, they end up sticking around in annoying ways. These artifacts stay in place when the unit moves, too. They disappear if you cancel the unit’s movement at any time, or after the battle sequence, or if you put your cursor over the unit and then move the cursor off of the unit. They’ll also appear on menu screens. Harken vanished when I put my cursor over him with Marcus’s map sprite artifacts on the screen. When I move the cursor off of him, the game corrects itself, Harken reappears, and the artifacts go away. 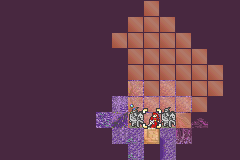 They even stick around when the game redraws the map sprites over again. If you can manage to force the map sprites to go inactive when the “danger zone” is active, that might solve these problems? Hmm. Not sure why that would happen. With the original usage it was impossible to be highlighting a unit when using the command, guess I’ll need to figure out a workaround. Also, I realize that I was testing with an older version - but I think it’s more useful when you can see the terrain and objective still too? Even though the map GUI stuff loses its blended transparency effect that’s relatively a minor issue. Just to confirm I went and replicated everything in the new version, too. Same issues persist. 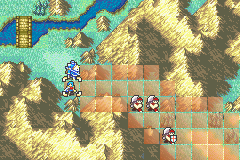 Well, it wasn’t easy, but I think I fixed the map sprites for FE7. Try downloading it again. 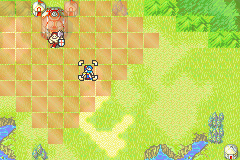 And now FE8 is also working. Whew. I can confirm that this has fixed every issue that I’d pointed out. Can’t replicate a single one. There’s another minor issue that’s kind of strange – I thought I’d noticed it in previous versions, but nowhere near as frequent as it’s happening now. No clue why, but occasionally the game gets confused and opens the minimap instead? For some reason it appears to be unit specific. 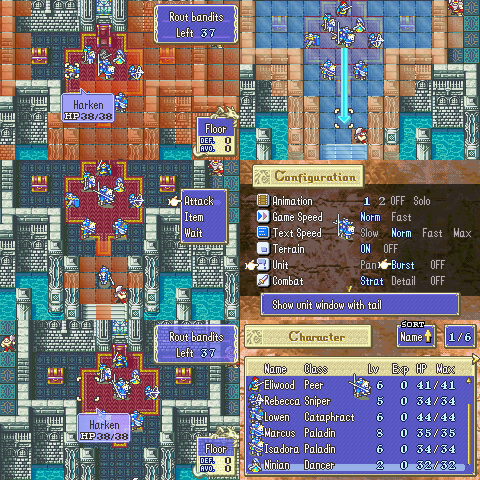 Pressing select while hovering over Priscilla or Raven keeps putting the minimap up, but Heath, Lucius, and Geitz work fine? Idk, I can send you a patch if you aren’t able to replicate this one. Try using it on a map with more than 2-3 units. Also, pressing A while the danger zone is active toggles the display off, but doesn’t bring the map GUI back so it’s a bit strange (most likely that’s IS’s fault tho). If you can, the A button should probably just cancel the display out the same way hitting B does. Also, pressing A while the danger zone is active toggles the display off, but doesn’t bring the map GUI back so it’s a bit strange (most likely that’s IS’s fault tho). This is intentional, A toggles between attack range and staff range. If there are no staff users, it will bring the map GUI back. I have no idea why you’d get the minimap sometimes, though. Does it only display ranges for status staves? That might explain why I didn’t notice since I use those so rarely (and usually only on FoW maps because I’m a terrible person). Welp, found a game breaking glitch. Pressing A then B on a unit, then showing enemy ranges and pressing R on the unit causes the game to crash. I am somewhat baffled here. Oh good that one’s not my fault, IS screwed up somewhere. Pressing select while hovering over Priscilla or Raven keeps putting the minimap up, but Heath, Lucius, and Geitz work fine? Yeah I was able to reproduce the glitch on my copy of EN. Changed the order of the function calls, now it works. I still don’t know why it was doing that, but at least it’s fixed. I mean, it’s hooking the select button into prototype code so there were bound to be imperfections. Fixed, all it took was several hours of disassembling to change one single byte. You know, easy. That’s some straight up pro wizardry right there. Thank you for your hard work on this! I would be surprised if this didn’t become a standard feature for hacks. edit: @circleseverywhere is it possible to add NPC ranges too? This is the kind of thing that makes me want to dust off my project and design a chapter around it. Well done, camarade! Anything’s possible, but I can’t say how much effort it would take. I’ll look into it. I’m so using this for my FE8 hack.